When I start a lace project, I usually get really obsessive about it and finish it pretty quickly. Except when something goes horribly wrong, and then the project goes into time out and sometimes never gets touched again (Heere There Be Dragone, I’m looking at you). I started my most recent project back in March, eagerly diving into lace after spending February knitting nothing but test projects and dishcloths. I picked Regrowth as the pattern primarily because 1) it is really pretty, and 2) it is adjustable at every step, and I had a skein of gradient yarn that I wanted to make the most of. Things were going along swimmingly until I was in the final section of the project – the edging chart, at which point I had a few billion stitches on the needles. Okay, possibly I exaggerate; it was only a couple hundred, but it sure *felt* like a few billion by that point. And then disaster struck. My interchangeable needles unscrewed just enough so that the stitches caught on the join, and as a result I dropped a whole bunch of stitches. Worse, when I tried to pick them back up again, a couple of them laddered down. I tried undoing just that small section a few rows down, but that only made things worse. By the time I finally gave up, I’d come to the realization that the only way to fix it was to unravel at least six rows back; maybe more. I stuffed the project into my bag and decided it (and I) needed a time out. 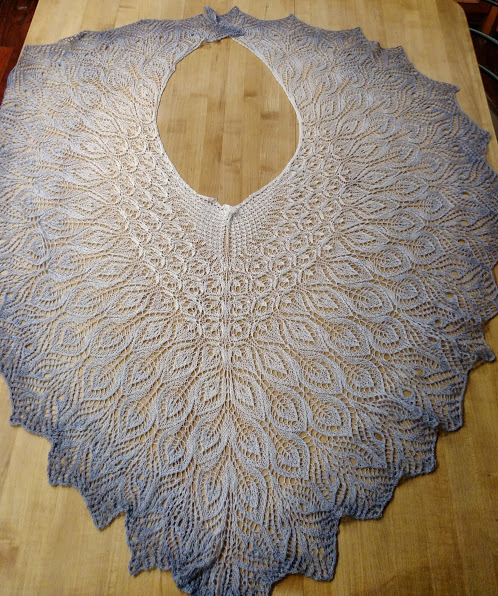 This month, however, a friend and I have come up with our next knit-along project (another Niebling pattern that is likely going to involve no small amount of swearing due to the size and complexity). 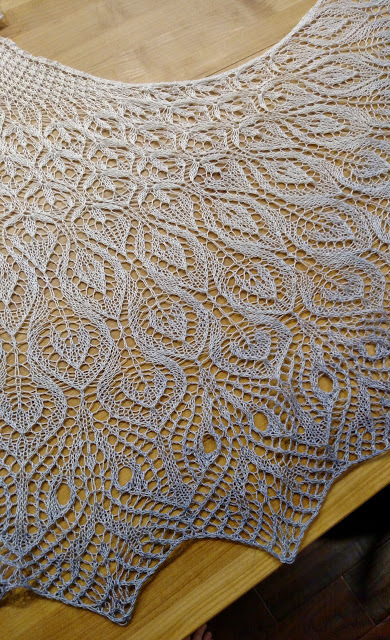 I knew I really wanted to get the current lace project finished before I cast on for a new one. So I finally pulled it out of the bag and grimly spent several hours undoing row after row (final count – 8 rows, several thousand stitches) until I’d gotten back to a point where everything was okay. Ugh. Thankfully, though, once I slogged through the worst of it, finishing it up was quick. I did a quick block (ha, ‘quick’) tonight with judicious use of the blow dryer because due to the fact that our spare room is occupied by kittens, I have nowhere with enough floor space to block a project of this size that is safe from certain grey cats who think it is oodles of fun to flop around on my lace and pull pins out with their teeth. So here it is, in all its gradient glory. And here is a closer shot that shows the actual motifs in the pattern. I had a rough idea of how much yarn each row would take and by the end of it, I was weighing the remainder every 2 rows, so I could make sure I’d have enough to finish. As it was, after I bound off, on a whim I decided to weigh what was left. Less than 1 gram. I’m not sure I could have cut it any closer if I’d tried.